CZT33 begins this weekend in Providence, RI and there are some pretty excited tanglers just itching to get there. They won’t have to wait much longer for this one-of-a-kind experience. There are just two certification seminars being offered in the USA this year, CZT34 takes place in June. In May the first CZT-Europe classes begin. More information about these and the CZT-Asia seminars are at the above link and on the ZENTANGLES > TEACHING ZENTANGLE page on the top menu bar. Belgian CZT Ria Matheussen shares another of her lovely tangles with us and Kadibra is not just pretty, it’s a very easy one to tangle. “Again, I found inspiration in a tattoo. This time not in New Zealand from the Maori people but in Brasil where the Kadiwéu indians are living. 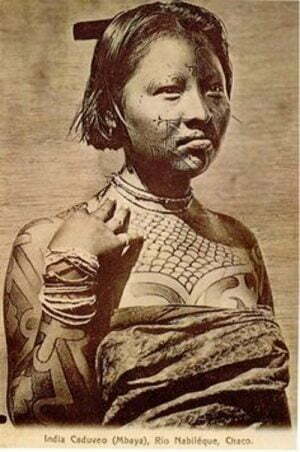 In the picture above, you see a traditional Kadiwéu woman with her tattoo’s, in the picture below you can see the authentic tattoo on which my tangle is based. 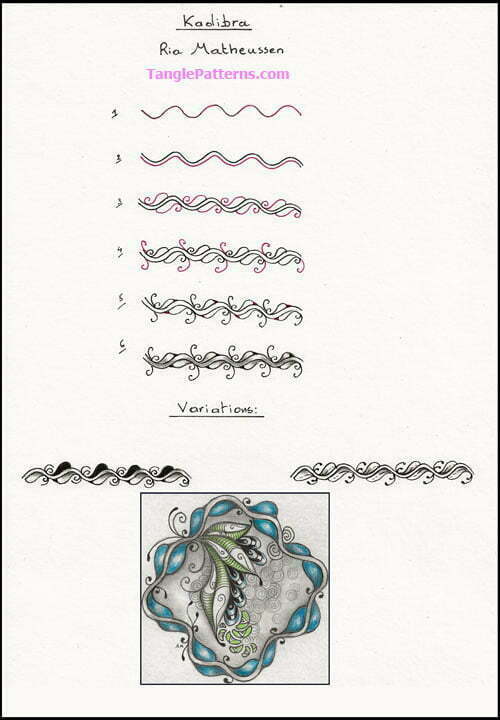 Ria’s Mazorito tangle was inspired by Maori tattoos as she referenced above, Kadibra “shares DNA” with her Ilac tangle. Thank you Kelley for this compliment, makes me glad! Thank you Sam, I’m always glad to know that other tanglers like my patterns. After finishing this pattern, I didn’t notice that Kadibra looks a bit like little whales, jumping in the sea, only when I painted them black I saw it. I’m very glad you agree with me. I’m fond of those big animals. Thank you for your kind comment. Oh that is a wonderful compliment. Thank you very much Bunny! This is absolutely delightful to draw! I can’t wait to use it in my work. I’ll play with it for sure. Thank you Ria! Thank you very much Heidi Sue, it is nice to “meet” you again. I’m glad you like this pattern and I wish you succes! I just now played with the pattern, adding a double Aura around it, and it turned out to be so pretty, I’m going to draw it that way as a card face for a very dear friend. It is an honour for me that you will use this pattern on a card for a dear friend and I’m glad to hear that you have found another variation. Thank you very much! What a fascinating tangle pattern! I think it will be quite a nice looking tangle to use in various ways. I also clicked on the information about the people. The culture of Zentangle is truly a world-wide and multi-person. Thank you for such a creative Tangle Pattern! Thank you very much for your kind comment. I agree with you: Zentangleart is truly a world wide and multi person. It is so nice to use patterns, made by people from all over the world and already a few times I have found inspiration in other cultures. I hope you will enjoy this one and I am sure you will find more variation! Thank you Ria Matheussen (and Linda, of course) for this pretty new tangle! When I saw it, it reminded me of Ilac, which I love. I look forward to playing with it! Linda, I can always trust you to come up with tangles that are both beautiful and are guaranteed to help me get my zen on. I have tried tangles from other sites, thinking that I liked the way they look, and often they just don’t take me where I want to go mentally. I really appreciate the thought that you put into selecting the tangles that you publish, and I look forward to the days when a new one comes – sort of like a mini-Christmas present! Kadibra looks like it will be another good one, so many thanks for all you do. Namaste, Dessie. My thanks to you too for your thoughtful words of support. Most appreciated. As Linda wrote, I do appreciate your words very much and I am very glad that you like my new tangle. I hope you will have nice moments while exploring Kadibra. In my examples, I used every time two “curls” but you can variate to draw them bigger or use more. It is very pleasant to give your own touch to the patterns! Success. Thanks to those who submit tangles and to you Linda for vetting them and then publising them on your site. You are my go to for new tangle ideas to try. I am retired and finally I have a lot of time to do what I like. I enjoy drawing and search for new tangles… It is pleasant to learn every day a little bit more and to grow in this wonderful art!!! Thank you Sue for your kind comment. That’s a beautiful and delicate, and uncomplicated tangle Ria! So glad that we have CZT’s that are great at deciphering and stepping out these tangles. I was never gifted that way! Thank you very much for your kind words Brenda. I believe that everyone can grow in this wonderful art and even can find new tangles or make interesting variations. I have not a special gift but I’m growing every day a bit by exercising. I always remember Maria’s wonderful quote: “Anything is possible, one stroke at a time.” I wish you succes! 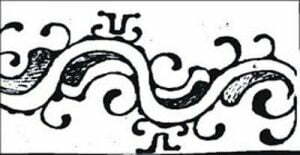 As I wrote, this new tangle is based on an authentic old Indian tattoo. I am not 100% sure, but I think there is a little part of this pattern, just abough the nose of that Indian woman on the picture. You can find influences from all over the world in different patterns of Zentangle art and that is really fascinating. Thank you for your kind comment. I’m very glad with your words Jan, indeed, this tangle needs not much to “flow”. I hope you will enjoy while drawing this one in your beautiful work! Kadibra is a lovely tangle! It’s intricate, but easy. Thank you! Thank you Mary, I just gave a few examples but maybe you will find one given your personal touch, I wish you succes and pleasure while exploring!